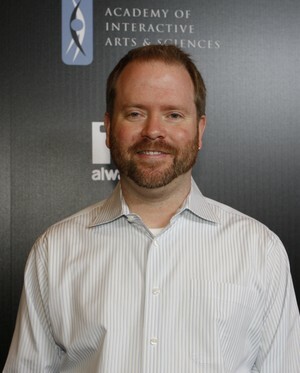 Tim Campbell is a member of the Academy of Interactive Arts and Sciences where he serves as one of its board directors. He works for Vigil Games. Q: What’s the one problem of game development you wish you could instantly solve? A: How to get quality games made on time and on budget without anyone having to work any overtime. Q: Tell us one of your recent professional insights. A: Our industry, as a whole, does not currently operate in a sustainable fashion for the long term. Fundamentals have to change. Q: When you look at the future is there one great big trend that affects everyone? A: Consumers are extremely well informed about their gaming options and you cannot fool them. Everything that you put into your game matters, so make it all count. Q: What's your favorite part of game development? A: Working with a talented group of creative people on a daily basis. Q: What game are you most jealous of? A: World of Warcraft. It changed the way we think of gaming and took what was previously a niche genre and grew the audience because of both its quality and accessibility. It is a game that has something for everyone at a high level of quality all in one package. It can be played solo, cooperatively, competitively and socially all in the same experience. For people like me who like a little bit of everything, it allows me to have a slightly different slice of gameplay every time I sit down to play. Add in the stickiness of the character progression and satisfying reward systems and you have a recipe for true addiction. A: Games are as important as any other form of mass entertainment. People need fun in their lives. Q: If you weren't in game development, what would you be doing today? A: I have no idea. I was parking cars before I joined the industry. Q: Do you think it’s important for developers to continue playing games? A: It’s essential that developers continue to play games to keep pace with the rapid evolution of game making. Q: What's the biggest challenge you see facing the industry? A: How to transition from a used games driven retail model to a direct, long-term, service-oriented relationship with our consumer. Q: On a practical basis, what’s the one thing you’re going to tackle next? A: Help make our company operate better through stronger management and communication practices.